As a long-time member of the National Association of the Mentally Ill (NAMI) and having had a lifetime of experience with people suffering depressions of all kinds, I can say that I am thrilled that the hilarious but didactic Modern Depression Guidebook by Dylan Brody has been written. It is hard to believe no one thought of this clever, back-door approach to healing or helping depression with laughter. Grateful for this book. Dylan Brody has written an upside-down handbook that gratifies true depressives with its wickedly surgical approach. Your tour guide stopped changing into clean clothes days ago. He ticks off Bottom Ten lists with laser-scope accuracy, and with whatever is the opposite of verve. The Modern Depression Guidebook is for people who think that the Gratefulness Movement should have filed for bankruptcy long ago. He’d ask you to sign onto a class action suit against cheerfulness, but he knows that would be too much trouble, and pointless. Just get his book, if you’re not too tired. 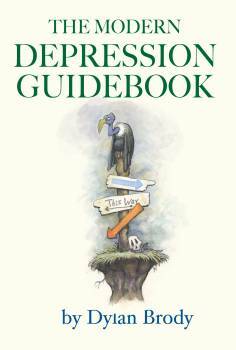 The Modern Depression Guidebook not only had me laughing but impressed me at the way it approaches healing and understanding of depression from an absolutely unprecedented direction. Your book will be excellent in any psychiatric setting dealing with depression. Your new approach is spectacular. Like millions of other Americans I sometimes get depressed. This happens frequently enough that I am getting quite good at it. My mood can swing like Diana Krall on a three-martini lunch. On a bright day when everything is going well I can find the hidden source of sorrow, the magic trigger and… Voila! The bleakness of the world comes clear to me and once more I am depressed. Through years of experience I have developed ‑‑ or observed myself to be practicing ‑‑ certain straightforward techniques to help a momentary sadness build upon itself, resonating and reverberating like feedback, doubling and redoubling down the corridors of my empty little life until, at last, I am comfortably ensconced in my apartment, using up my sick days to watch Little House on the Prairie with my cat who has made it very clear that he will not be coming near enough to comfort me until I take a shower. With this book, I hope to share some of my hard‑won expertise with others who may seek to improve their skills in experiencing, maintaining, and utilizing a depression. Whether you are a one‑time depression‑sufferer due to a painful break‑up or a chronic depressive whose sadness recurs regularly, there is no excuse for not putting time and effort into getting the lowest possible lows out of your moments of despair. Here is where this Guidebook comes in. With useful exercises to help you improve your sense of self‑loathing, easy‑access listings of worldly injustices to ponder, and helpful hints on how to break your personal hygiene habit, this book is sure to have your mood spiraling downward like Larry Flynt at the Guggenheim. But depth is not all there is to a depression. A depression must also be valued for its duration. In order to ensure that a bout of melancholia lasts a good long while, attention must be paid to detail in the vital settling‑in period. If you stick with the program, follow the simple, step‑by step instructions in this book, cut your personal productivity, and increase your TV‑watching time sufficiently, I can personally promise that you will see no mood brighten before its time. Some of what I say may already be familiar to you. You may have figured out on your own that a steady diet of Chips Ahoy cookies and Yoo‑Hoo throws off your sugar balance and helps to generate nausea and palpitations, which you are then free to interpret as a horrible, life‑threatening illness. Still, you are likely to find other useful ideas that may never have come to you naturally. You may have overlooked the benefits of leaving your laundry unwashed and scattered about your home in unsorted piles, for instance. It may never have occurred to you to deliberately skew your sleep patterns so that you snooze through business hours and have the long, lonely night to ponder the missed opportunities with your eyes riveted to the wee‑hours’ televised parade of skin‑care infomercials and send-us-your-gold ads. From the handy list of unhealthy comfort foods to the easy‑to‑follow instructions on how to alienate your friends, this book will help you make your next depression the best ever. And once the blues have deepened into black, even old hands at the sadness game are bound to find new insight and inspiration in a unique and entirely original approach to the contemplation of suicide. You will feel your spirit plummet as your fleeting fantasies of death take shape in your mind, forming complex and intricate plots, leaving you with a dark, lingering death wish of which you can really be proud. So, whether you are happy enough to delude yourself into believing that life is a pleasant experience of which depression is a small but necessary part or depressed enough to realize that life is miserable with occasional flashes of illusory joy, you are ready for this Guidebook. Whether you are in it now, or you feel with a gnawing certainty that it is coming soon, you know depression is a fact of life. You might as well give it your best shot.